Concrete is proud to once again partner with Danny Wimmer Presents for 2017’s Fort Rock Festival in Fort Myers, FL and Welcome To Rockville Festival in Jacksonville, FL. We compiled 20,000 CD samplers to be distributed to festival-goers at both shows. These samplers included the latest singles from bands such as The Pretty Reckless, Lacuna Coil, Seether, Nickelback and many others! 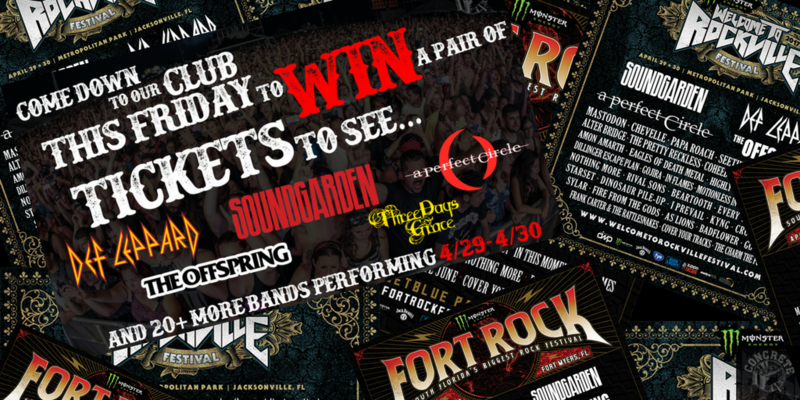 We also held a ticket giveaway promotion with local strip clubs in the Fort Myers and Jacksonville areas. In the weekends leading up to the shows, the clubs held giveaways that resulted in a total of 32 tickets given out for both festivals! Special thanks to Lauren at Thee Officers, Luis at Bare Elegance and Emrah and Shawn at their multiple clubs for their help and participation.